2017 Liquid Force Primo Wakesurfer. Take a look at the new 2017 Liquid Force Primo Wakesurfer at S2AS! Okay we get it, you're indecisive. One day you want to ride loose and the next day you want to tighten it up. Luckily, the Primo is here and it's going to be your best bud. This versatile hybrid skimmer has a three-stage rocker perfect for many styles of riding. For those times when you need a little extra tang, the tri-fin setup can be reconfigured to one fin for a loose ride; or keep the outer fins on for a clean snappy feel. Tight or loose the Primo is a great choice for riders that want it all. CNC EPS Foam Core with Stringer. Triple Concave Into Quad V Channels. Low Volume Variable Edge Rail. 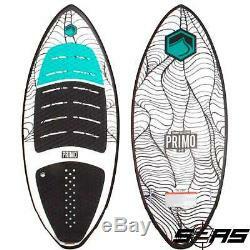 Three Fin Design - Remove fins to adjust the board to different style of riding. EVA Traction - Top deck has skived EVA for traction. Poole Harbour is 300 meters of waist deep water so that you can never get out of your depth, offering a solid platform for learning to kitesurf. We pride ourselves on offering the highest quality of Kitesurf lessons available. This is a not just another watersport this is a lifestyle. S2AS is not just a kitesurf school in Poole, Dorset, Water or snowboard sports shop were a lifestyle brand. Our team lives and loves what we do, If were not teaching kitesurfing or in the shop were at the Wakeboard cable on the beach Kitesurfing or taking trips to the snow. Were putting in the groundwork constantly testing and proving our knowledge so that we can provide the best quality equipment on the market to you. We don't stock anything that we don't believe in, We understand the need you have to find gear that you're going to enjoy and trust riding every time you go out. We spend days testing so you don't have to. Some of the top brands that we stand by are Cabrinha Kites and Slingshot Kites for kitesurfing. They have an amazing build quality for a product that is going to last. For wakeboarding we have Ronix Wakeboards and Liquid Force Wakeboards they are always innovating and pushing the sport to new directions such as the Brain Frame Technology from Ronix. For accessory's we have a huge selection accessories like wetsuits and impact vests from O'neill and Mystic, Sunglasses from Oakley and stand up paddleboards from Jobe and RRD so we have something for everyone. We also arrange Snowboarding, Kitesurfing and Wakeboarding holidays all year round - these are not to be missed! Thats enough about us we want to know about you, Pop into our Shop in Poole, Dorset and say hi If your thinking about leaning to Kitesurf or just want to come and have a look we would love to see you if not in the shop at least on the water. Have fun from all the Team at Surface 2 Air Sports (Rider owned Rider run). The item "2017 Liquid Force Primo Wakesurfer" is in sale since Monday, September 25, 2017. This item is in the category "Sporting Goods\Waterskiing & Wakeboarding\Wakeboards & Kneeboards". The seller is "s2as" and is located in Dorset. This item can be shipped worldwide.